It´s been forever since I read Middle Grade books. And I have never reviewed one on this blog. 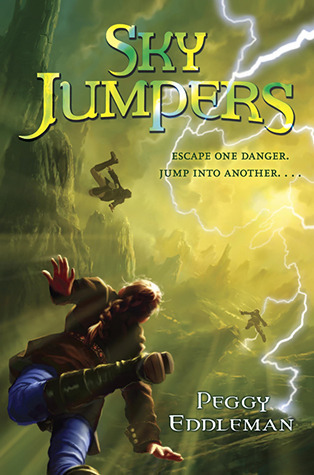 But let me tell you something, when I got pre-approved for SKY JUMPERS by Peggy Eddleman on Netgalley, I jumped up and down. See, Peggy was one of the first bloggers I followed and interacted with. Her blog´s always delightful and she´s so very nice that I thought the blogging community was going to be a great place to be (and I was right!). You know when you start reading a book and you´re nervous because you want to love it but you´re not sure if you will. Well, as soon as I finished the first page of SKY JUMPERS, all doubts went out of the window. I fell into the story right at the beginning, the characters grew on me and I wanted to know what would happen to them. Hope is my kind of characters, she´s trying so hard to be perfect, not realizing that what she sees as weaknesses are seen by others as strengths. Really, there is a moment at the beginning of the book when I wanted to pull Hope into a hug and tell her that she´s special, despite not being good at inventing things. The secondary characters are not secondary. The relationships of Hope with all of them makes them special, and makes them leap off the page. The adventures. SKY JUMPERS is full of them. Between the bandits arriving in town, the need for medicine, the jumps, protecting their loved ones, Hope and her friends embark on scary adventures. It´s a page turner! Like the name of the main character, this story is full of hope. Hope in people, hope in the world…despite the hardships and all that they´re going through. If you end up picking it up, I would love to hear your thoughts!